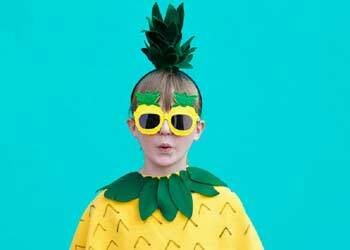 Pineapple Costume Ideas: With Halloween coming up it is time to decide on a costume. What do you choose? 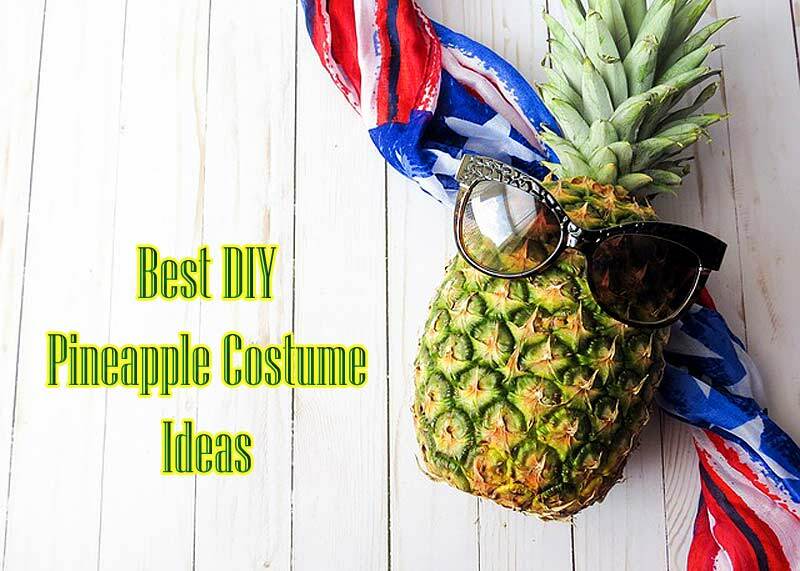 The requirements may be simple, stylish, artsy or on a budget, and if you need that variety to choose from, you should consider these DIY pineapple costume ideas. 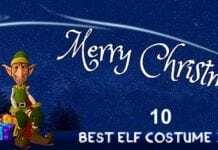 Because we all love easy, stress-free costumes, and we all love pineapples, it makes sense to compile the best of the pineapple costumes on the internet. 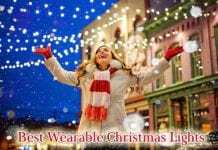 There is no replacement for a handmade dress whether you are on a budget or not. This Pineapple Dress has zippered pockets! At Tipsy Elves we make the most outrageous clothes to make your life more fun. 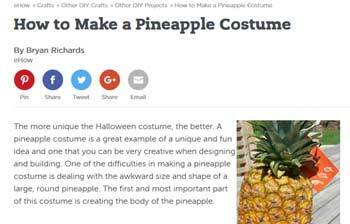 Making a costume may seem overwhelming but not with this great DIY pineapple costume ideas listed below. 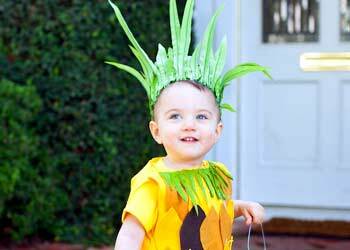 Here are the top 10 pineapple costume ideas for Halloween or any party occasions. This no-sew costume is made with felt and materials easily collected at the local craft store. 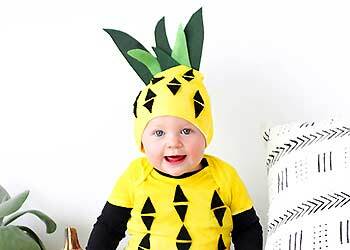 It gives detailed, step-by-step directions for assembling the costume, including building the pineapple top with leaves, a craft roll, and a headband. Hands down the easiest costume to make, it requires a yellow dress, a headband, some green paper, a craft roll, and some glue. The directions make this a quick and easy variation on the classic costume. The simplest costume for the little pineapples this year: adding fabric details to a yellow beanie and onesie. One of the great benefits of this costume is if you size up the onesie you can add layers for warmth in colder climates. Bryan Richards gives a creative take on the pineapple costume, including a hula-hoop for the pineapple shape. 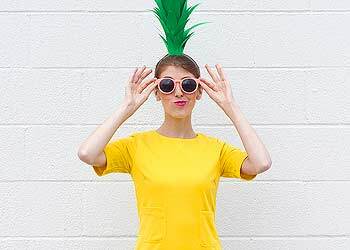 This costume will bring out your crafty side, and the full pineapple look is an excellent detail for adding to the look. The pineapple costume by xxluaraxx on Instructables uses fabric to build the pineapple top, rather than paper and uses fabric paint to add more detail to a yellow dress. 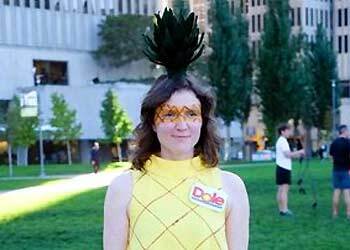 The costume topper is a Dole label, making your pineapple unique. Bonus: if doing a family theme, brand each costume differently. This costume is versatile! The model is adorable, but this costume is so simple it would work for adults, and other fruit, too. The simple Pancho design is so easy to make, and the hat draws the eye to the pineapple top. Mandy Beyeler’s costume is super easy, but she adds the detail of a neutral tight under her pineapple dress and could be exchanged with yellow, green or light brown tights. This is an excellent idea for colder temperatures. Another no-sew kids costume, with the most adorable pictures illustrating the process of assembling this easy hand-made costume. Made entirely from scratch this felt costume is sure to call to the creative minded. Sometimes last minute costumes need to be very budget and time friendly. 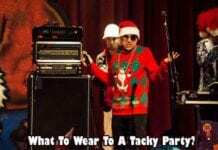 Sincerely Jean gives us a quick tutorial for that the perfect costume if you are on a budget. 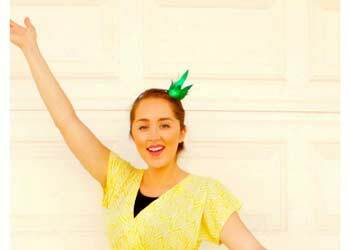 This costume has a simplified version of the pineapple top headband for those tight on time. And one final detail for your Halloween costume ideas. If you can’t leave your four-legged family member and they need to participate in the festivities, Kelly Bryden can help with this dog pineapple costume tutorial. 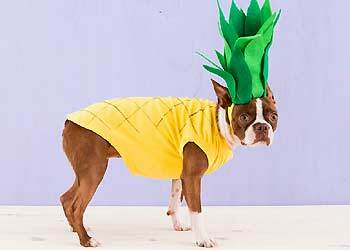 Your dog will be the attention hog in this adorable pineapple costume and will stand out among all the other costumed pups at the party. 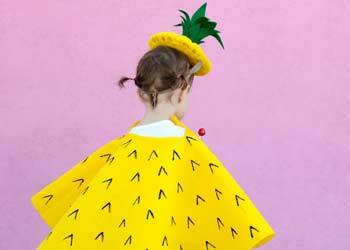 No matter if you arrive at your event as a pineapple family, or just the dog is a pineapple, these costume ideas will stand out and any gathering this year. Pineapples for Halloween, or any costume party, are merely the most comfortable costumes to put together and have so many variations to choose from. 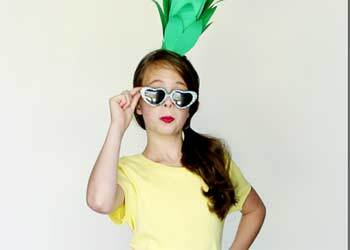 A pineapple costume is a cute, simple costume idea that anyone can assemble, and everyone will love the bright color.